We’re spreading the holiday cheer this year by sharing some favorite Christmas recipes from our team! My favorite Christmas recipe is from my grandmother. She had a friend who worked in a candy store; I believe it was Fanny Farmer because my grandmother always had boxes of chocolates from them. She made English Toffee every Christmas and handed this down to my mother, who also made it every Christmas – that is how I ended up with this delicious recipe! I make it occasionally, but it is so buttery good that I have a hard time keeping the portions under control! Directions: Cook, stirring constantly until it reaches 300 degrees (or until the hard ball stage). Pour on a cookie sheet and cool. Spread melted chocolate on top and sprinkle with toasted, crushed almonds. Try not to eat it all! 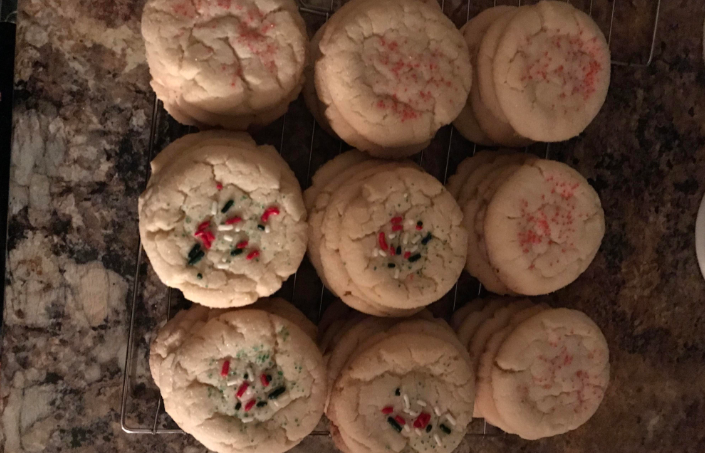 My mom made these sugar cookie every Christmas. They were my favorite! I have her recipe but they never seem to turn out the same way that SHE made them. Mix all ingredients and chill. Roll out dough and cut out shapes (use a glass cup to get circles). Bake at 350 degrees for 10-12 minutes. My grandma gave me her rosette iron years ago (it’s older than I am!). Every year, I make a couple batches of these yummy treats for my family and friends. Combine eggs, sugar, and salt; beat well. Add remaining ingredients and beat until smooth. Heat a rosette iron in deep, hot oil (375 degrees) for 2 minutes. Drain excess oil from iron. Dip in batter to 1/4 inch from the top of iron, then sip iron immediately into hot oil (375 degrees). Fry rosette until golden, about 30 seconds. Lift out; tip upside down to drain. With fork, push rosette off iron onto a rack placed over paper towels. Reheat iron 1 minute make next rosette. 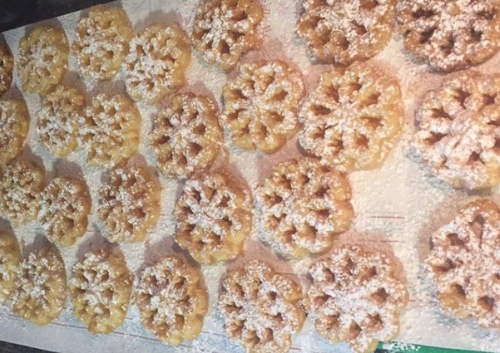 Sprinkle rosettes with confectioners’ sugar. This one is from my husband’s family. They usually made the Ham balls for Holidays, they are incredible! I could not believe the food they always made…they would serve these with mashed potatoes and have home made noodles with Chicken (like soup) to use as the gravy! What a treat when we were at his Mom’s. Preheat over to 325 degrees. Mix all non-sauce ingredients and roll into orange-sized balls. Put in a cake pan. Mix all sauce ingredients and pour over ham balls. Bake 1 1/2 hours at 325 degrees. My husband’s FAVORITE pie. 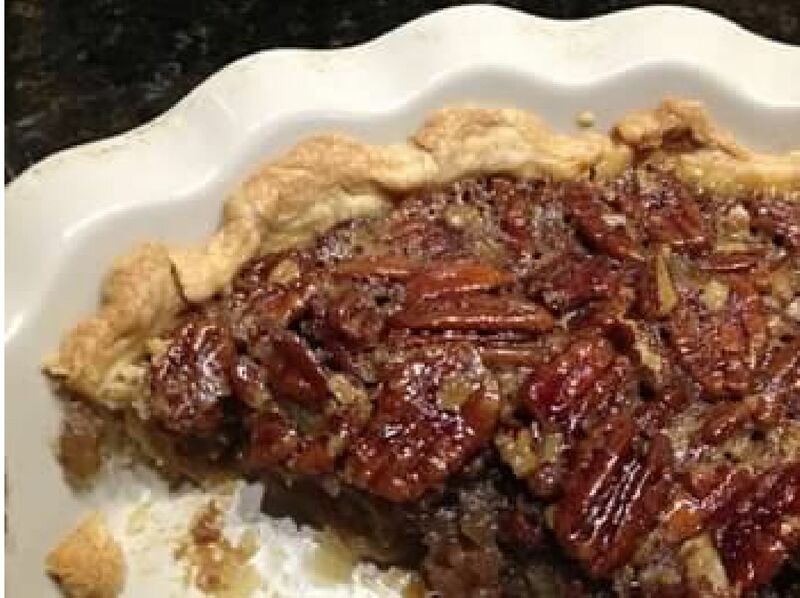 I never liked pecan pie until I tried this recipe; now it’s my favorite, too! Over medium heat, bring butter, sugar, corn syrup and salt to a boil, stirring constantly. Remove from heat and stir in pecans, vanilla and bourbon. Set aside and cool slightly (about 5 minutes) while you beat eggs. Whisk eggs into mixture until smooth, then pour mixture into pie crust. Bake on lower rack until edges are set but center is slightly loose (about 45 minutes), then cool on rack.